I would like to draw the following deformed grid in Tikz. I have written something that achieves visualisation of homogeneous deformations of a normal grid as in the following MWE, but it cannot handle drawing the deformed grid shown in the link. Any approach would be appreciated but I would favour updating the \tikzset to achieve this. You can use nonlinear transformations in TikZ. Here I basically scaled the x coordinate with the logarithm of the current y coordinate divided 100 just for demonstration. Draw uniform lines/grid on a distorted square/axes? How can I draw this arrow in tikz? Tikz how can I draw this string/wiring diagram? 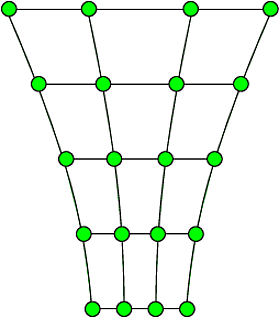 How can i draw this shape using tikz?